Cut potatoes into spirals using the medium grating attachment on a spiralizer, cutting the spirals with kitchen shears after 4 or 5 rotations. Soak potato spirals in a bowl of water for 20 minutes. Drain and rinse well. Pat potatoes dry with paper towels, removing as much moisture as possible. Place potato spirals in a large resealable plastic bag. Add oil, salt, and pepper; toss to coat. Preheat an air fryer to 360 degrees F (180 degrees C). Place half of the potato spirals in the fry basket and insert into the air fryer. Cook until golden, about 5 minutes. Increase temperature to 390 degrees F (200 degrees C). 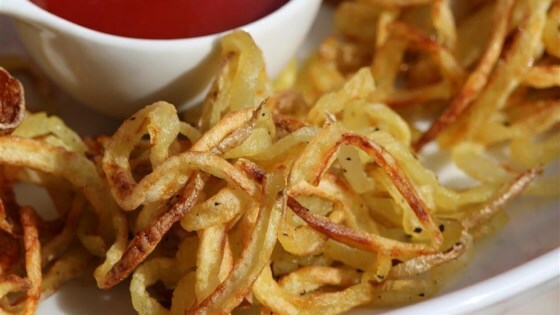 Pull out the fry basket and toss potato spirals using tongs. Return basket to the air fryer and continue cooking, tossing occasionally, until golden brown, 10 to 12 minutes. Reduce temperature to 360 degrees F (180 degrees C) and repeat with remaining potato spirals. Excellent recipe. The timing was perfect. At 13 minutes the potatoes were crispy outside and soft inside. I left the skins on. I had to use yukon gold potatoes. Thank you for the recipe. Make sure you have a large spiral maker. I have the white as seen on tv one. Did the large but turned out like hash browns stuck together. Cooked half the time stated. Tasty but not curly. 3.21.18 The air fryer performed magnificently, the potatoes were crispy good. This recipe is easy and delicious. I used the smallest setting on the spiralizer and they came out great. I also subbed olive oil. We thought these were very good. Very easy to make. Will make again. Love it!! Mine were ready in 7 minutes but that's because my spiralizer does not have options re size. Very tasty but very addictive. Great recipe, thanks for sharing.